Do you find yourself struggling to match thread colours to the fabric that you intend to use in a project? Maybe you are about to run out of a thread colour that you want to replace as near as possible with another make. We haven’t found an accurate conversion chart yet that perfectly matches threads between manufacturers so unless you’re ordering the same type of thread and have the relevant product code it can be a real lottery if ordering online or by telephone. It’s much easier if you can take your thread or fabric with you to a store and match up (providing the lighting is good of course). between the myriad of shadings that can make such a difference to your embroideries and stitching. Take your shadecard and fabric to a window with natural daylight or use a Daylight Lamp if you have one and your matching can be done at home with total accuracy. If you don’t trust your own eye then ask a friend or family member who has good colour sense to confirm. Not all manufacturers can supply this type of chart and of those that do they will most likely charge because they are costly to produce – but for any sewing enthusiast it’s a lovely resource to have at hand and well worth the investment. If you like to use Floriani embroidery thread you can buy the latest shadecard at half price. A generous wrapping of Floriani thread for every colour has been inserted into this gorgeous six-page fold-out card for easy matching. At only £2.99 for a 1,000 Metre King Spool this high-lustre, smooth running polyester embroidery thread is attractive and affordable making it a popular choice since its introduction 10 years ago for hobbyists and even commercial embroidery. The collection includes 60 fabulous new colours including vibrant blues, reds, greens as well as soft off-whites and skin tones. 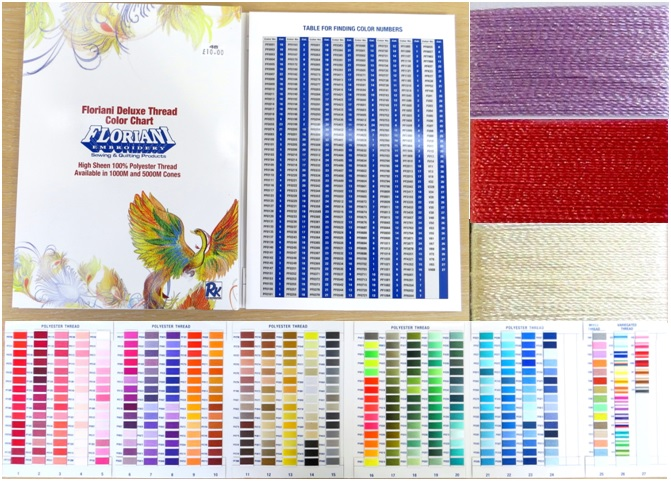 Now totaling 360 solid shades plus an additional 35 variegated and twisted colours the range of threads have become even more exciting for UK embroidery enthusiasts so if you haven’t tried it yet we can happily recommend. Why not try one before investing in a shadecard? 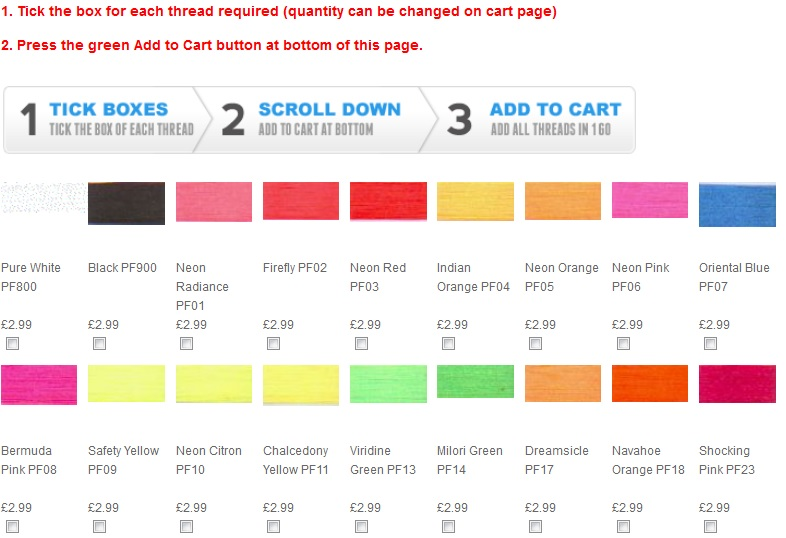 We have also made it very easy and quick to order all the solid colours on our website with our Quick Buy system where you can just put a tick next to your colour choices and add them all into your cart in one go. FREE POSTAGE is available on all orders above £30. With so many embroidery and sewing products available in addition to threads most customers have no trouble achieving free carriage. 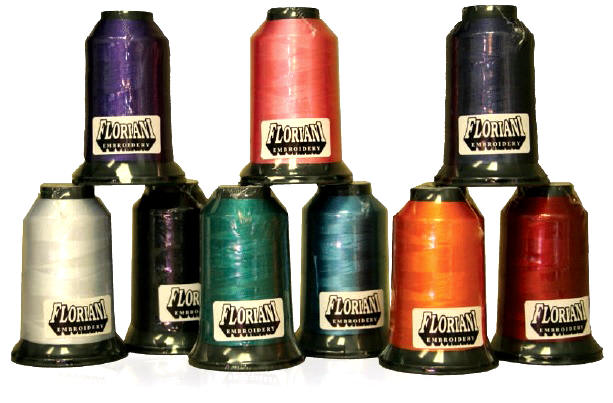 Floriani thread is also available to buy off the shelf 7-days a week in our store at Oswaldtwistle Mills. This entry was posted in Inspire. Bookmark the permalink. I bought two colours I needed yesterday. I got home and found these colours matched the fabric perfectly. My grandmother used to tell me there are shades of black, I have found there are shades of charcoal also and I have the correct shade now. Floriani sews so well and the lustre is wonderful.